On this same day at this same hour of every year, the same ceremony is conducted in more than 900 locations across America and around the world—wreaths are placed on graves in military cemeteries on the second Saturday of December. It is called Wreaths Across America (WAA) and is an outgrowth of the Arlington Wreath Project, started in 1992. As the popular ceremony spread across the country, WAA was formed in 2007. Here in Seattle, the theme of the 6th annual ceremony was “Never Forget.” Michael G. Reagan, famed artist of the “Fallen Heroes Project,” was the Keynote Speaker. Reagan was awarded the Citizen Service Before Self Honor (known to some as The Civilian Medal of Honor) on 25 March 2015 by the Congressional Medal of Honor Foundation in Arlington, VA. The local ceremony was held at Veterans’ Memorial Cemetery, Evergreen-Washelli, on 12 December. 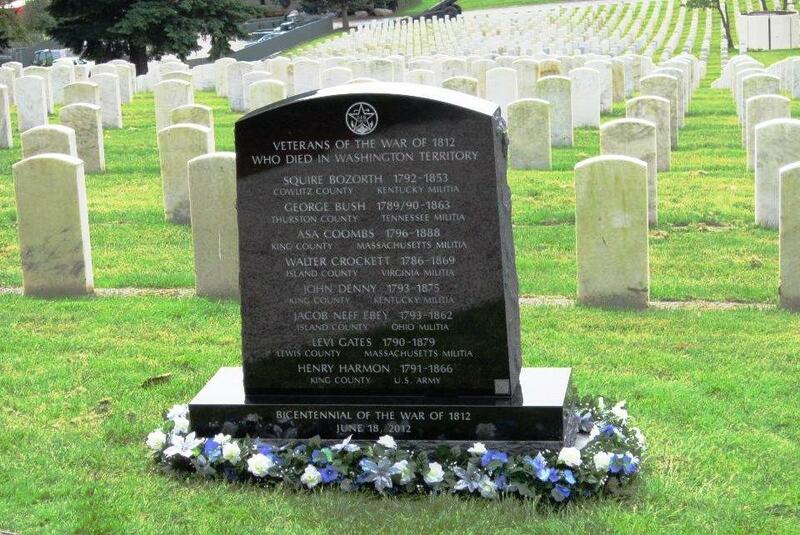 Six military Medal of Honor recipients are buried there. The Navy Wives Club of America (NWCA), Totem 277, led by Donna Turner and Crystal Wilkerson, started hosting this event in 2010. Lorraine Zimmerman is the club’s WAA project leader and site coordinator for Everygreen-Washelli. Totem 277’s territory is from Seattle to Burlington.The primary element of the annual ceremony is the ceremonial wreath dedication by representatives of the Army, Navy, Marine Corps, Air Force, Coast Guard, Merchant Marines, and POW/MIAs. “Never Forget”–William W. Wilson, former POW, places flag on wreath, followed by hand salute. Photo by Jacque Hodgen. Among the many voluntary participants was the VFW Post 1040 Honor Guard. As Post Bugler, I played “Assembly” on my Super Olds cornet at 9 a.m. as Zimmerman issued the Call to Order and the 62nd Airlift Wing Air Force Honor Guard presented the colors. To close the ceremony, the VFW Post 1040 Honor Guard fired a perfect rifle salute, and I sounded “Taps.” Afterwards, participants and audience members placed wreaths on numerous tombstones in the cemetery. My previous posts on WAA on this blog dated 16 December 2011, 9 January 2013, and 28 April 2015. One photo below is by Geoffrey T. Lewis. All others are by Jacque Hodgen. Please click on any photo to enlarge it. 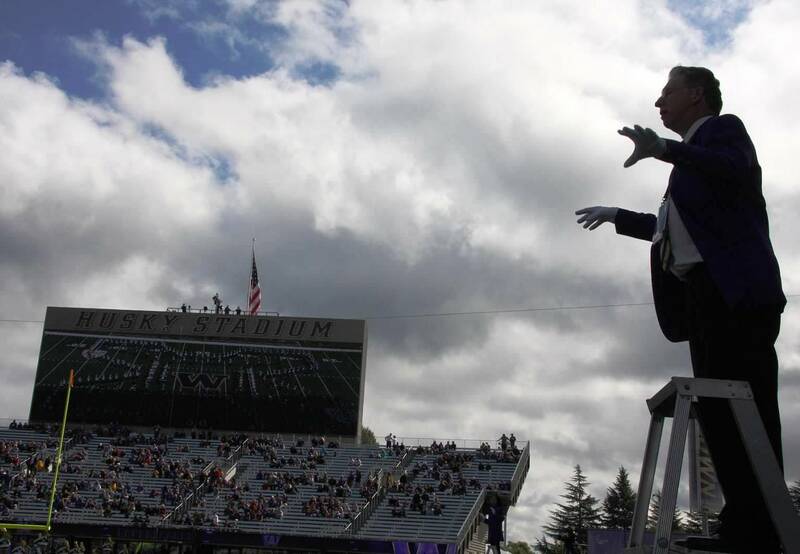 On 21 September 2013, the University of Washington Husky Marching Band, under the direction of Dr. Brad McDavid, hosted its annual “Band Day.” In 2013, the Husky Marching Band, created in 1929, commenced its 84th season. Selected high school bands from all over the state performed in the second home football game held in the newly renovated Husky Stadium in Seattle. The Huskies beat the Bengals of Idaho State University, 56-0, and as a member of the Husky Alumni Band, I got to play my 59-year old Super Olds cornet again. I’m of the UW Class of 1962. The photos below were taken by Louis Figueroa (ground level) and Garry Nakayama (press box level). Please click on any photo to enlarge it. Our family tradition on Christmas Eve includes singing Christmas carols after dinner and before opening gifts. My wife plays piano as we sing, and a few years ago, we added a couple of trumpet solos to the program. This year, I played “Mele Kalikimaka” because on all our minds was the recent loss of my wife’s mother, Ruth, who died peacefully on 12 October. This was our first Christmas without her. To Ruth, Hawaii was paradise. She and her husband, Mac, first went to Waikiki to celebrate their 25th wedding anniversary. They always returned annually until he passed away, and then she continued to go back. In all, she vacationed there for 39 straight years! She was a bright spirit, and we miss her so much. “Mele Kalikimaka” means “Merry Christmas,” and Robert Alex Anderson wrote the song in 1949. Bing Crosby and The Andrews Sisters recorded the song in 1950 on Decca 27228 (78 rpm)/9-27228 (45 rmp). To hear their recording, please see http://www.youtube.com/watch?v=WJhYrC8Rq8w. 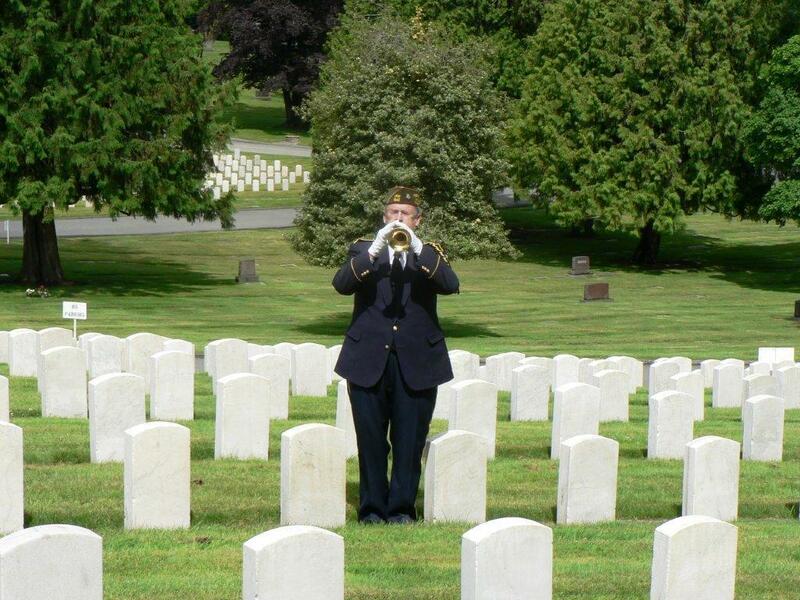 For my second trumpet solo, I played “Angels We Have Heard on High,” a traditional French carol. 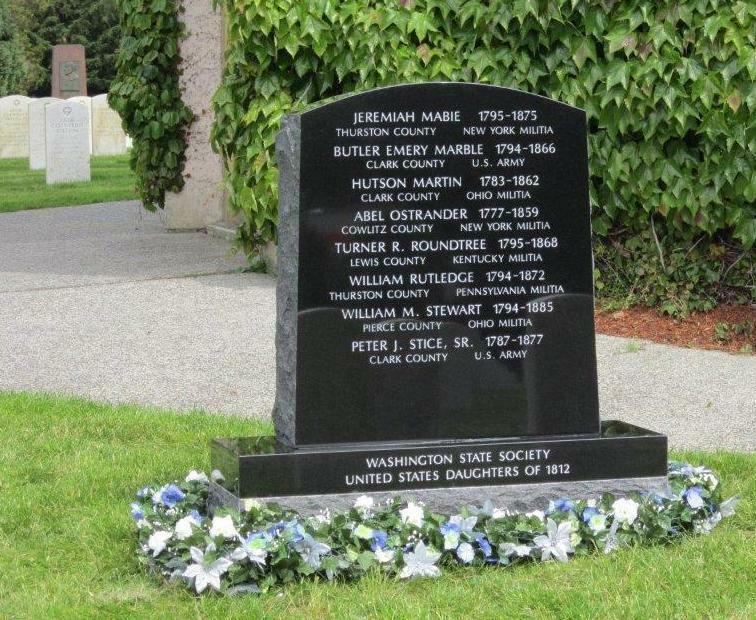 For six years, the Washington State Society, United States Daughters of 1812 (WSSUSD 1812), labored hard on its project to dedicate a monument honoring those veterans of the War of 1812 who died in Washington Territory. 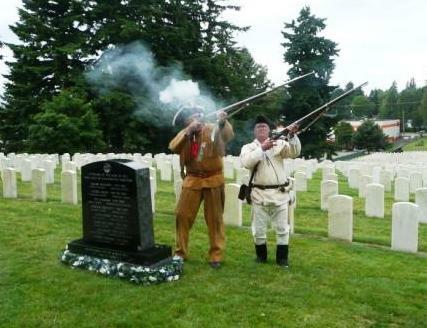 At last, the ceremony was held on Saturday, 23 June, at Evergreen-Washelli, Veterans Memorial Cemetery, in north Seattle. The war had started on 18 June, 200 years earlier, when President James Madison signed the declaration passed by Congress. Of the 16, Abel Ostrander was born first (1777) and William M. Stewart died last (1885), a span of 108 years. Ostrander came from New York and died in Cowlitz County in 1859. Stewart (born in 1794) came from Ohio and died in Pierce County. Perry, U.S. Navy, penned the famous words, “We have met the enemy and they are ours…” Fifth, the British burned the White House and the city of Washington in August, 1814. Sixth, in January, 1815, as the war drew to a close, Major General Andrew Jackson (“Old Hickory”) defeated the British Lieutenant General Sir Edward Pakenham in a lop-sided victory at the Battle of New Orleans. Seventh, Robert Fulton invented the “torpedo,” now known as an underwater mine, and designed the world’s first steam-powered warship, Demologos (later renamed Fulton). Men from WASSAR and ladies from Washington Regency Society (WRS). Bob O’Neal (white hat) sounded “Echo Taps” with Glenn Ledbetter. Men from WASSAR by life-sized replica of the Liberty Bell. L to R: Lee Thomasson, Gale Palmer, Bob O’Neal, Stan Wills. Francis Scott Key spots the garrison flag flying over the ramparts of Ft. McHenry after a day and night of constant bombardment by British ships. Illustration by Percy Moran. The garrison flag which flew over Ft. McHenry during the bombardment of 13-14 September 1814. Note the 15 stars and 15 stripes.